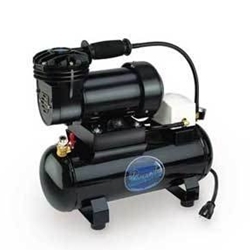 This oilless diaphragm compressor is a tank mounted unit, designed for compactness and portability. The sturdy air tank stores reserve air volume and reduces pulsation. Air pressure in the tank is regulated with an automatic on/off limit switch to a maximum of 40 P.S.I. The unit has a five foot grounded 3 wire cord.